Begin by spraying a non-stick spray in a pot, add the onion, bell pepper, and celery and cook until soft. Add the diced chicken and cook until no longer pink. 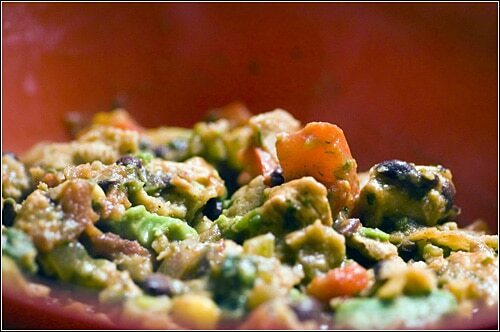 Add the black beans, fire roasted diced tomatoes, green onions, 1 cup of the water, salt and pepper to taste. Pre-heat the oven to 400 degrees and pop the corn tortillas on a cookie sheet and into the oven, cook until golden. About 10-15 min depending on your oven. Keep a close eye on these. 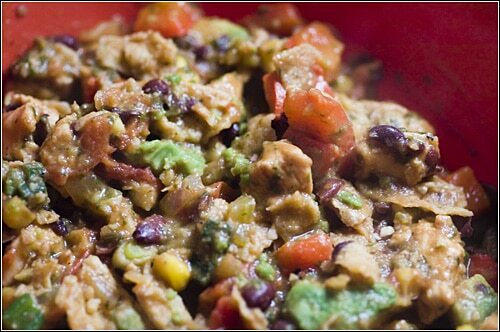 In a mini food processor, add the garlic, 1 cup of the water, the chipotle pepper, and the cilantro. Process until mostly smooth. Add that to the soup. Add the shredded cheese, avocado, and the crumbled corn tortillas. For those doing Weight Watchers it’s 4 points a serving. This recipe makes 7 servings. 1 cup = 1 serving. This soup is more stew like, you can add more or less water to taste if you want it more soupy. Mix everything in a microwave safe bowl, pop it in for 3 minutes or until peaches get a bit soft. For those on Weight Watchers, this makes 1 serving at 2points. 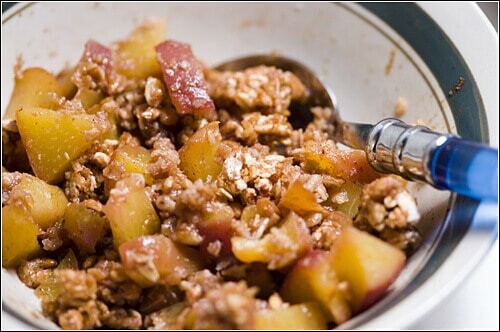 Is Ghetto Peach Crumble any different from regular Peach Crumble?